Some choose to shout their love message from the hill tops. For some nothing short of sky writing will do. Most guys though prefer more conventional ways of telling their loved ones they really care. The world’s most romantic day, Valentine’s Day, will come and go. Cards will be opened and read, flowers and chocolates enjoyed and some ladies will be fortunate enough to receive a more significant and enduring gift of precious jewelry. One new jewelry retailer sets itself apart as ”The World’s Most Romantic Jeweler” and according to Steve Crane, founder, "Amoro really specializes in romantic jewelry from the affordable to the fabulous and is the only place to find jewelry incorporating Amoro’s Personal Pleasures.” Crane also claims that “Amoro is the only place to buy a unique, patented diamond cut he calls the World’s Most Romantic Gemstone - the Pristine Hearts. 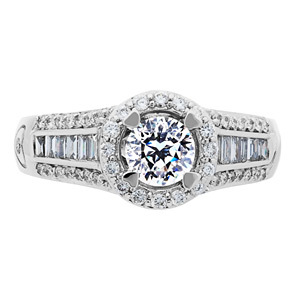 A round diamond that actually has a perfect heart visible to the wearer through the top of the stone. It’s a special patented cut that took many years to develop by the Lakhi Group and its US patent was actually issued and dated 14th February 2006. “Having its patent coincidentally issued on Valentine’s Day totally affirms the claim of the world’s most romantic” insists Crane. 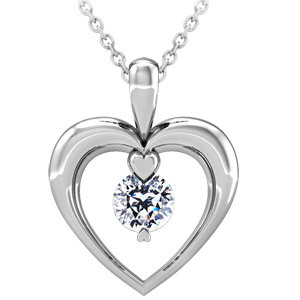 “Only a few hundred of these unique diamonds are available and Amoro has a great collection of them set in romantic 18kt white gold jewelry priced from $1395 to over $10,000.00 just in time for Valentine’s Day 2011. Amoro’s buyers are really industry savvy. From experience know how to control costs which combined with their low overhead e-commerce business model allows Amoro to price their luxury fine jewelry gifts seriously less than famous jewelry brands. Crane believes "Giving the World’s Most Romantic Diamond, set by the World’s Most Romantic Jewelry on the World’s Most Romantic Day" is a winning combination for those who want to delight their Valentine today. A romantic gift; but to have that gift go on reminding the wearer of the love that it signifies is an enduring, forever-lasting gift”. Pristine Hearts® is a registered trademark of Lakhi Group. 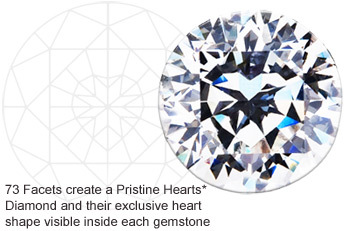 Pristine Hearts® Diamonds by Lakhi Group are exclusively available at Amoro.com. Amoro crafts fabulously affordable fine jewelry in precious metals and a variety of gemstones including the Amoro Eternity Cut® Diamond and the unique Pristine Hearts® Diamond. Each Amoro creation combines special features to increase its comfort, security and value in exquisitely made, modern interpretations of timeless and classic jewelry designs. Amoro uses only precious stones that, from their experience, deliver the most beauty for the price. This exclusive combination of practical features, design excellence and fine craftsmanship at affordable prices is unique to Amoro and adds up to the best value for money in exclusive precious jewelry. symbol of celebration at the very best value and price everyday. 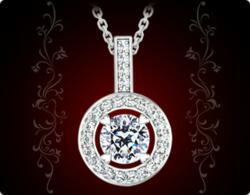 For more information and to view the complete collection of romantic jewelry, visit http://www.Amoro.com.